When is the right time to take on a leadership role? Will you ever feel ready? When Franca Gucciardi accepted her first CEO position at the Loran Scholars Foundation, she quickly realized the immense task ahead of her and contacted her mentor, Alan Broadbent. What followed was a series of conversations, and a process of learning to ask (and then answer!) the right questions. You’re It! 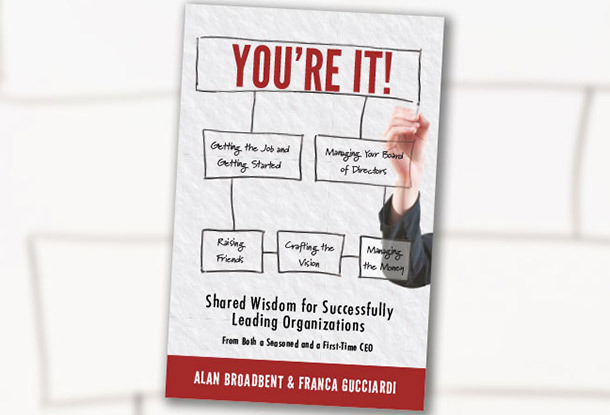 is a mentorship in book form, the collected wisdom of Alan Broadbent and Franca Gucciardi, two experienced CEOs. This practical and accessible guide to leading an organization is everything you wanted to know about being a CEO but were afraid to ask. Once you become CEO, the success or failure of your organization is all up to you: You’re It! Alan Broadbent is chairman and CEO of Avana Capital Corporation and chairman of Maytree, an organization committed to advancing systemic solutions to poverty and strengthening civic communities. He has co-founded and chairs a number of initiatives including the Caledon Institute of Social Policy, Tamarack – An Institute for Community Engagement, and the Institute on Municipal Finance and Governance at the Munk School of Global Affairs, University of Toronto. Alan is the author of Urban Nation: Why We Need to Give Power Back to the Cities to Make Canada Strong, and co-editor of Five Good Ideas: Practical Strategies for Non-Profit Success. He is a Member of the Order of Canada and recipient of the Queen’s Diamond Jubilee Medal. Franca Gucciardi is the incoming CEO of the McCall MacBain Foundation. From 2004-2017, she served as the CEO of the Loran Scholars Foundation, a charity that identifies and supports exceptional young Canadians who demonstrate character, service, and leadership. Prior to this, Franca designed and implemented Canada’s Millennium Excellence Award program. In the community, Franca is board chair of College Montrose Children’s Place and a member of the Leadership Council of the Ian O. Ihnatowycz Institute for Leadership at Ivey Business School. She is a Fellow of the International Women’s Forum and a recipient of the Gil Bennett Gold Standard Governance Award and the Sara Kirke Award for Entrepreneurship and Innovation. Bulk purchases: For bulk purchases, please contact info@zephyrpress.ca. Authors Alan Broadbent and Franca Gucciardi provide insights on what it takes to be a successful non-profit leader. Maytree is committed to advancing systemic solutions to poverty and strengthening civic communities. We believe the most enduring way to fix the systems that create poverty is to have economic and social rights safeguarded for all people living in Canada. Sign up for our newsletters to receive regular updates on our work.